The runaway train that devastated the Quebec town of Lac-Mégantic on July 6 was at least the seventh serious runaway train incident in Canada since 2006. CBC News takes a look at six similar railway accidents. 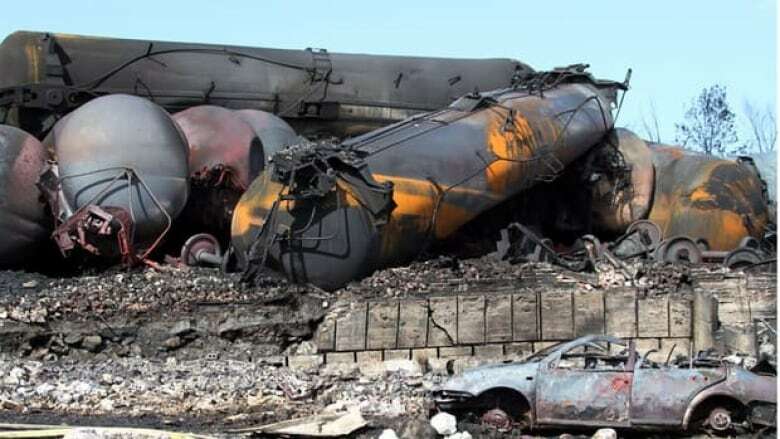 It is still not confirmed why the oil-tanker train that devastated the town of Lac-Mégantic, Que., was able to barrel down the tracks unattended. But it is not the only runaway train in Canada in recent years. Also, there were eight incidents of runaway rolling stock during the first five months of 2013, TSB statistics indicate. Reports have not been published so CBC News has not evaluated those incidents. The TSB requires railway companies and their employees to report any incident where rolling stock – a rail car, for example – runs away. There was a total of 121 incidents of runaway rolling stock – major and minor – between 2003 and 2012, according to the TSB. Here's a look at other major runaway train cases since 2006. Jan. 18, 2012, Hanlon, Alta. 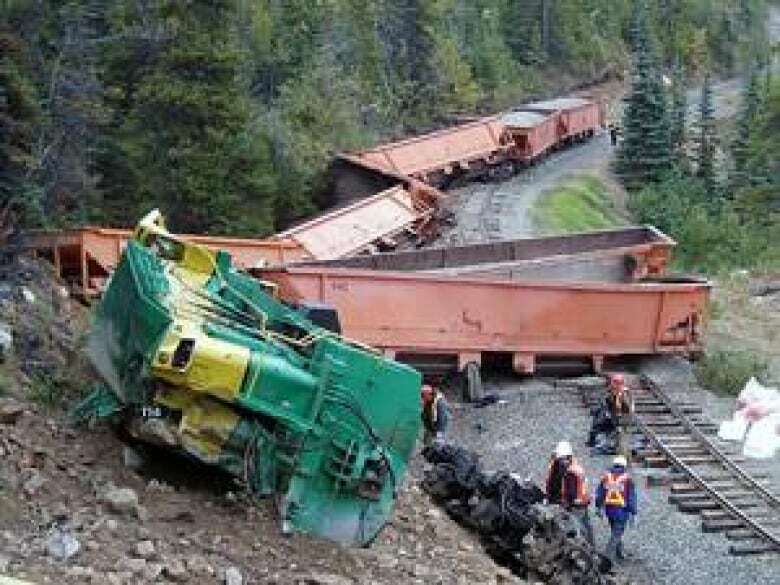 Thirteen loaded coal cars belonging to CN Rail, which had been set out the previous day in a siding, rolled uncontrolled down a one per cent grade for about 4.8 kilometres and collided with the head end of a stationary train. Nine of the 13 coal cars and the three leading locomotives from the stationary train derailed. One crew member was seriously injured, two sustained minor injuries. About 2,800 litres of fuel and 670 tonnes of coal were spilled. About 75 metres of track was damaged. The TSB analysis suggested that the runaway resulted from an insufficient number of handbrakes being applied when the cars were left at the siding. The requirement was for two handbrakes, but just one was applied. However, given the weight of the cars and the grade, the TSB estimated that at least five handbrakes should have been used. Dec. 11, 2011, Dorée, Que. The locomotive engineer had secured a freight train belonging to Quebec North Shore and Labrador Railway and loaded with iron ore after the train had experienced problems with its automatic and dynamic brakes, which use trains' electric traction motors. The problematic train had two locomotives and 112 Labrador Iron Mines gondola cars. An hour later, the train's air brakes released and the 35 handbrakes the engineer had applied proved not enough to hold the train. The engineer, who was beside the train while waiting for assistance, saw the train moving and jumped onboard the lead locomotive. He applied the dynamic brakes, which were not working properly, but the train continued to accelerate as it descended the grade. Only when the track leveled off did the train finally stop, intact. No one was injured. A Transport Canada inspection later found that the Labrador Iron Mines cars included many with air brakes that "were not applying or were not remaining applied and that several hand brakes were not operating well." The TSB said that 57 handbrakes working properly would have been needed to secure the train. The rules then in effect required a minimum of 12. Feb. 11, 2009, Nanticoke, Ont. A runaway train belonging to Southern Ontario Railway with four locomotives and 43 cars (14 with dangerous goods, including gasoline), travelled almost three kilometres before a derail switch did what it was designed to do. Nine cars derailed, preventing the train from entering a hydro plant. "The crew left the train unattended on a one per cent grade, without the train being properly secured," the TSB reported, noting a series of "deviations from standard operating practices associated with train securement." There were no injuries, but 31,000 litres of gasoline were spilled and 90 metres of track were destroyed. 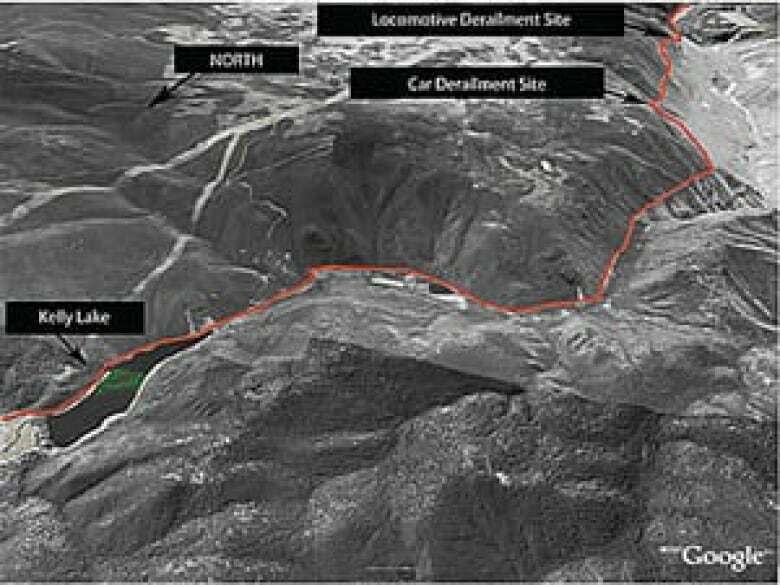 "Securing a train made up predominantly of dangerous and special dangerous commodities, adjacent to a major refinery on a descending grade, requires increased vigilance to safely complete the task," the TSB report concluded. Dec. 29, 2008, Waneta, B.C. A freight train operated by Kettle Falls International Railway with 12 cars and two locomotives started moving and quickly began to head down a steep grade. 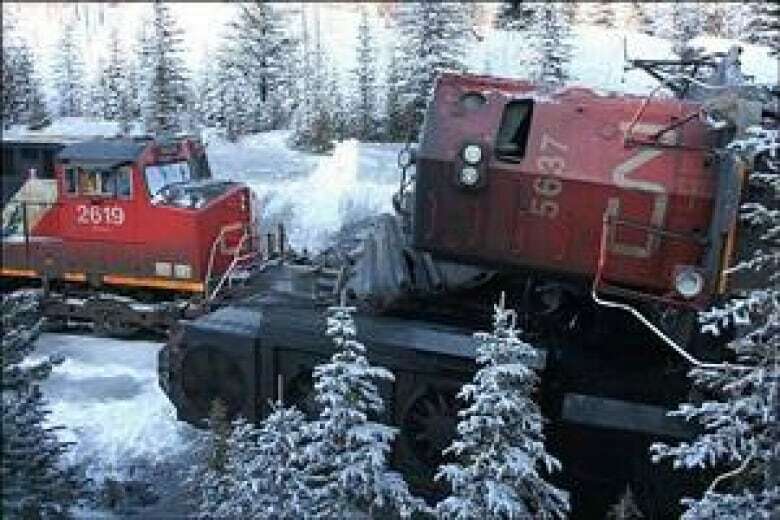 The locomotive engineer was unable to reduce the train's speed, and with the train accelerating past 32 km/h, he decided to jump from the train, landing in deep snow. The runaway train collided with stationary cars after travelling about 4.5 km, causing it to derail, along with some of the stationary cars. The engineer received minor injuries from his jump, 13,600 litres of fuel were spilled and a highway was blocked for two days. All but one of the derailed cars were destroyed. The TSB concluded the main reasons the train would not slow down was a result of insufficiently charged brakes along with operator error when applying the emergency brakes. April 23, 2007, Trail, B.C. On April 23, 2007 a Canadian Pacific train descending the Warfield Hill into Trail, B.C. derailed, killing the engineer. The TSB does not call it a runaway train but report that it "ran uncontrolled." Therefore, despite appearances, it's not counted here as a runaway train. Two other crew were injured when they jumped off before the two locomotives and eight loaded cars derailed. Three other cars stayed on the tracks. The grade on Warfield Hill, up to 4.1 per cent, is the steepest in North America, according to the TSB. The investigation found that the combination of automatic, independent, and dynamic brakes used in the attempt to control train speed resulted in friction fade that diminished braking capacity by at least half. Friction fade happens when friction from applying tread brakes heats wheels, resulting in a significant loss of braking force. The higher the speed, the greater the loss. Sept. 3, 2006, Log Cabin, B.C. A work train with one locomotive and eight cars loaded with gravel operated by the White Pass and Yukon Route railway became a runaway while travelling down a steep grade. After failing to bring the train under control with the brakes, the conductor jumped, landing in a small stream. The train, which reached 72 km/h, derailed on a sharp curve. The three other crew members were trapped inside. Bruce Harder, 45, was killed and the other two sustained serious injuries, as did the conductor. According to the TSB, the train was too heavy due to overloading, and it was "likely that the brake systems on all of the ballast cars were functioning at a diminished capacity." June 29, 2006, near Lillooet, B.C. A CN locomotive pulling a car loaded with lumber became uncontrollable while on a steep descent in the Fraser Canyon heading into Lillooet, B.C. The conductor then disconnected the coupling between the locomotive and the car, climbed onto the car and made his way to the back to apply the hand brake. The lumber car, now on its own, derailed on a curve, throwing the conductor from the car. The other two crew had left the cab, hoping for an opportunity to jump off, but before they could, the locomotive derailed on another curve. The trainman was killed and the engineer was seriously injured. The conductor also died. The TSB concluded that the loss of control resulted from an inadequate braking system -- the locomotive did not have a dynamic brake. The TSB also found that "locomotive operations were implemented without doing a formal risk assessment to identify potential operational hazards in this challenging physical environment."